By now, if you’re running any type of business you’re aware — at least in passing — of the global employee engagement statistics. Per Gallup, Aon, PwC, and a host of others, the numbers are bad. In North America, it’s estimated that approximately 30% of employees report feeling totally engaged. Globally, it hovers around 13% depending on the survey. Even if you take the best numbers in each case, there’s a good chance that 6 in 10 of your employees are not engaged in their day-to-day work. Perhaps you’re thinking, maybe the point of work isn’t engagement or purpose. Maybe it’s stability at the individual level; a paycheck, health benefits and vacation time. And for the organization; it’s about growth and profit. You aren’t alone, that’s how many people think, and have thought for years, and it’s not necessarily wrong. After all, there have been studies that show having overly-engaged, highly-motivated employees can be bad in the long-run: career arcs and company growth models are much more a marathon than a sprint. You can burn people out with too much engagement. That’s why I believe “engagement” is probably the wrong term to use. I lean more towards the term “inspiration.” Inspiration comes from the Latin inspirare, which means “to breathe, or from within”. 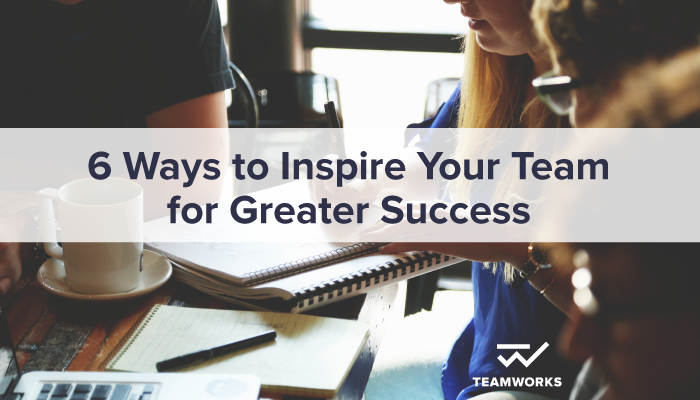 Your employees need to be inspired to be great. There’s simple math behind this theory and it looks something like this: When an employee isn’t inspired, they tend to take a project and dawdle all day on it — especially if they fear a culture where new work, out-of-context, can always be heaped on their plate. On the other hand, an inspired employee can tackle 4-5 projects each day compared to their uninspired counterpart. That kind of engagement and inspiration makes a marked difference in the productivity of your teams and the potential for successfully driving initiatives forward. Of course, I understand that updating rows on an Excel spreadsheet may not be inspiring work to many. The truth is, not everything we do in a day has to be. There are “shallow” tasks at work, and there are “deep” tasks at work. Sometimes logistical work needs to get done. The trains need to run on time. You can, however, find ways to inspire your employees every day. It begins with real, effective leadership and not by hiding behind once-a-year performance reviews, or speaking to employees via e-mail. You inspire others by being a real human who manages the performance, energy, passion, and motivation of others. In the course of doing that, you’ll see revenue grow. You likely have a gut instinct that tells you whether or not your team is inspired. If not, there are some tell-tale signs to look for: high levels of absenteeism, last-minute “work from home” days where it’s hard to get a hold of the employee, lack of communication between team members, missed deadlines with no explanation. These are all potential indications that you have one or more disengaged, uninspired team member. If you’re experiencing any of these symptoms, there are some key steps you can take right now to start building the inspiration and engagement levels within a team that long ago seemed to stop caring. Understand where your value lies: It’s hard to be inspirational if there’s misalignment on value. Some CEOs pride themselves on telling each department head how important they are to the business. This is great, in theory, however it can often lead to dozens of definitions of value within an organization. The sheer fact is: every business or organization delivers something of value or importance. The easiest way to hone in on your ultimate value is to spend time with members from different levels of your team defining the why of your company: namely, Why does it exist? What value do you provide? (If you think “value” is a little bit of an ambiguous term for your industry, think of it like this: what solution do you offer and what problem do you solve for someone that would spend their money on your product or service?). Align strategy and execution: Employees in a middle management position or below often arrive at their jobs every day with a series of checklists to complete. But often, the projects and tasks they’re assigned have little or no connection to what the senior leadership is thinking about, or working on. This disconnection of purpose and action can lead to entire projects or teams feeling irrelevant, and can take a costly toll on their inspiration or excitement for their jobs. The remedy is aligning purpose, strategy and execution. First you collectively create a purpose for the organization. Then you create a strategy for each team. Then you turn that strategy into weekly or monthly priorities. Now that the purpose, strategy and priorities are clear, assigning tasks and projects to the team ensures that they are executing directly to the strategy you’ve defined. Be sure to revisit this process every month or you run the risk of mission drift and revenue stream drift, and people end up working on no-ROI projects for six months. Hardly inspiring. Align strategy with priority with execution and revisit it. Retrain some of your managers: Andy Grove, one of the founders of Intel, had a lot of specific approaches to management and the role of management. As Intel was one of the first major Silicon Valley companies, many of Grove’s approaches have filtered down to today’s working world. Grove believed, for example, that the main function of a manager was to move projects from Point A to Point B. As new revenue streams emerge, though, the types of projects you’re moving and the skills you might need to do so change. In those situations, you need to be re-trained. That could involve financial courses, lessons on the IT structure of the organization, how the supply chain works, or a host of other possibilities. Too often, companies shift elements of their operations towards improvement of the end product, but don’t make the corresponding shifts in people. This has been a major reality for companies in the last 20 years trying to “go digital” without training their employees on what that means and how it shifts their day-to-day responsibilities. In short: people aren’t going to feel inspired by their work, or go along with new initiatives, if they don’t have the skills to shift with you. Oftentimes, new training is necessary. Discuss failure more openly: Social media sites like Facebook are sometimes referred to as “relative comparison on steroids.” You see a picture of your friends beautiful family or great vacation shot and think, “I wish my life was more like theirs.” The problem is: that picture is a moment in time. You have no idea what came before or after. The comparison is useless. This problem comes up at work a lot too: businesses tend to only discuss success, and avoid any references to failure (until the doors are closing). As such, some employees can look around and think, “everyone else is succeeding”, even if they don’t feel individually successful in their position on within their team. This can lead to a loss of inspiration and drive. They perceive themselves to be the single small failure in a sea of success. To avoid this, leaders need to create pathways to discuss failure more openly. It may sound counter-intuitive, but this very strategy was used by the Balchem Corporation in the U.S. and their stock growth was 107,000% (yes, not a typo) from 1985 to 2015. Recognition programs: Imagine this; you’ve worked for the same company for six years. You’ve been given a few annual raises or cost of living increases, but beyond that, you’re never really recognized by anyone above you in the hierarchy. Would that inspire you? It probably would — inspire you to start polishing up your LinkedIn profile! (By the way, about 23% of North Americans look for a new job every single day — which speaks to this inspiration problem too.) Many CEOs are concerned about the potential cost of recognition problems, but there are hundreds of no-cost things you can do. Try holding quick morning huddles where a different person gets recognized every day. You can also keep a chart of each direct report’s career goals and have monthly meetings where you discuss the progress they are making towards their goals, instead of towards projects. Measure: As a CEO you’ve been trained to pay the most attention to those business aspects that are highly tracked and measured. Inspiration can be difficult to measure, it’s that “you know it when you see it” kind of thing. But there are ways you can begin to measure the inspiration and engagement of your teams. Consider looking at statistics like: turnover by manager, churn by manager, net promoter scores, employee engagement survey scores, internal pulse (weekly or bi-weekly questions blasted out), etc. If these aren’t things you’re already tracking, then start today. Keep data on these indicators and analyze this data as religiously as you analyze your fiscals. Track inspiration. See when it’s low. Adjust and pivot. If you’re still not convinced that an inspired team can make a bottom-line difference in your organization, consider the cost of turnover and hiring new people. When your employees aren’t inspired they will eventually leave. Those that leave need to be replaced. Hiring processes are costly — and because many are rooted in subjectivity, they don’t always result in a perfect hire. Meaning that new employee could end up becoming uninspired as well. That’s a distinct bottom-line hit — not to mention that the turnover of these employees takes valuable knowledge out of your organization. New hires need on-boarding which takes time and resources making turnover deadly for long-term productivity. The sure-fire way to beat back turnover is to keep your people inspired in what they do. Sure, some employees may leave a job that inspires them one that offers more money — but you can’t control that, necessarily. Oftentimes, though, if it’s less than an extra $20K, an inspired employee will stay with you because they like the work, they believe in what they do every day, and they want to succeed for themselves and your business. This is why inspiration matters: less cost out, more knowledge in, and a better overall working environment. I agree with this post wholeheartedly. I am a CEO of a mid size consulting firm in a very competitive field. My competitors have often reached out to my employees to retain them, however, they all decline or ignore potential offers of employment. I think the reason for this is the respect and appreciation shown to them on a regular basis. I compliment their work, recognize their efforts and make them feel like they not only contribute to the success of the company but are a true asset that makes the fabric of the company. I have taken my staff on several team building vacations, for instance in 2015 I took half the staff to Vegas and the other half to New York. This year I took half the staff to Chicago and the other half to Boston. This was strictly for recognition and appreciation as there was no “shop talk” just pure fun. My employees feel a sense of ownership and take their job very seriously. I think employers need to appreciate their staff and boost the employees who feel underappreciated. My leadership style has generated more profits than my competitors and we are at the top of our field. At the end of the day, I need to sleep at night knowing that my staff has my back….and this I know to be true.